Though the Philippines has never really been able to hitch itself to the Southeast Asian backpacker trail, its crown jewel island of Boracay has been consistently voted the world's favorite tropical island, and some of Boracay's beaches crowd top ten lists each year. 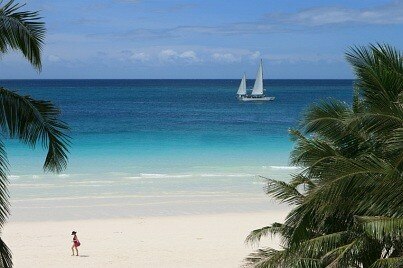 So what else does Boracay have that the rest of the Philippines doesn't? Located on the west coast of the main island in the Philippines (Luzon), Manila is a bustling and lively capital city that is one of the most populated in the world. With over three decades of Spanish colonization, Manila has some distinct architecture and heritage including churches, forts and other colonial buildings. Known as the Queen City of the south, the multicultural city of Cebu is located on Cebu Island in the Philippines. This vibrant city is a popular destination for visitors from all over the world as Cebu seamlessly blends interesting attractions and rich culture with modern facilities. Boracay's sights are few in number but this doesn't seem to bother the people who love it here, as they tend to travel here for the sun and the sand. The dramatic landscapes of other parts of the Philippine archipelago are not particularly common here though the beaches are routinely rated among the very best in the world. The two main things to do in Boracay are surfing and swimming. Behind that are activities such as lying on a beach towel in the sun, or lazily snorkeling just off the beach. Boracay's entertainments are few but the quality of the beach life here is so high that there is a lack of demand for any new developments. Naturally, fresh seafood is the specialty of this tropical island that was a fishing village in a previous life time. There are some very upscale places to eat in the five- star resorts of Boracay but in general, food is a pretty casual affair with snacks like coconuts on the beach or plates of fried rice and tomato sauce served over the counter at beer bars. The city of Manila has both Spanish and America influences on its architecture, heritage and culture. The Spanish controlled the city for over three decades and built countless buildings and churches. After the WWII destruction of the city, restoration has been slow, with only some historic structures restored. Shopping lovers will truly enjoy the amazing selection of shops, malls and markets in Manila. The city is one of the best shopping destinations in Asia for inexpensive goods. Boracay has grown up as a cosmopolitan place with influences from all over the world. People have returned here year after year from northern Europe and North America while the surfing scene has brought industry in from all over the world. English is widely spoken and routes in and out of the island are well traversed and inexpensive. Though continually praised as a sandy beach resort world capital, Boracay is never going to win any awards for its shopping. Shell jewelry and beer by the case are pretty much the only two big buys in Boracay. There is only one shopping mall on the island and many convenience stores stock only the basics, especially during the wet season when shipping lines are constricted. The cosmopolitan and bustling city of Manila has a wide variety of entertainment to suit all tastes and budgets. There are shopping malls, amusement parks, discothèques, bars, outdoor activities and performing arts. Dining in Manila is a great experience, with a wide selection of flavors and cuisines from around the world. Filipino food has been strongly influenced by the Spanish occupation of the country. Visitors will find some of the best Spanish cuisine in Asia in Manila. Cebu boasts a large number of shopping malls which consist of several floors and contain hundreds of shops as well as entertainment options such as movie theaters and food courts, making the city a great place for bargain hunters. The modern city of Cebu has a wide range of exciting attractions and activities to offer tourists. Perhaps the main attractions in the area are the picturesque beaches, which are excellent places to soak up the sun and practice a number of different water sports such as scuba diving and snorkeling. The enchanting historical city of Cebu boasts a large number of interesting old buildings, which jostle for place alongside modern shopping malls, restaurants and bars, making this a fascinating tourist destination. Cebu is a multicultural city and English is widely spoken, meaning that visitors should find communicating relatively easy. The people who live in Cebu City are warm and welcoming and although public transportation is somewhat lacking, there are plenty of taxis available. This sophisticated city has a large number of gourmet restaurants to choose from, and food lovers will be in their element here. Street carts, stalls and food courts cater for those on a budget, and it is impossible to go hungry in Cebu as many eateries are open 24 hours.